If you like the smell of newspaper, this candle is the one for you. 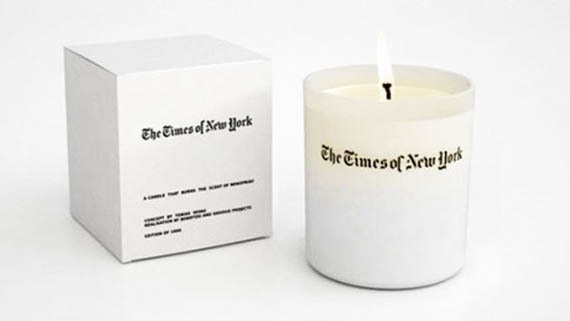 The New York Times Candle was one of designer-artist Tobias Wong, who passed away in 2010, last concepts. With the current fascination with scents and, especially, experimental scents, Wong proposed producing a candle with the fragrance of newsprint inspired by The New York Times, an institution he greatly admired and with which he had a longstanding relationship. The project, though in progress, was never actualized. So you’ll just have to stick to sniffing the Sunday Styles.